Have you ever wanted to see the International Space Station? Can't afford a 25 million dollar flight? Well your best bet then, is to see the space station from your own backyard! 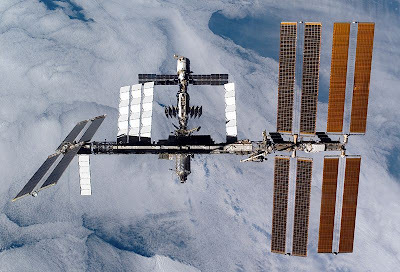 The International Space Station makes a little less than 16 orbits per day. This means that the ISS could be seen in your area as often as twice a day. Knowing when and where to look, however, is key. The ISS is visible to an observer on the ground only when it reflects light from the sun back to your eyes on Earth. The reflection is stronger when its solar panel arrays are at just the right angle. The station will not reflect the sun's light back to you if it is in the Earth's shadow, of course, so there are typically one or two times a day that it will be visible at your location. These times are usually near local dusk, or shortly afterwards. The ISS or any satellite will appear as a bright star, moving across the sky, almost like an airplane. The easiest way to tell a satellite from an airplane, however, is that satellites do not blink, and they fade in, then fade out. Heavens Above is a website that tracks the ISS, along with many other satellites, and gives information on when they will be visible. Simply register at their website, enter your location in your preferences, and you have access to tons of data on hundreds of satellites. You can get lists of all satellites making visible passes over your area, or you can get information on when satellites such as the ISS will be visible for the next 10 days. So get out and see the ISS! Its easy and requires no equipment. Try telling someone to look up just before it passes. They'll wonder how you knew it would appear! Many thanks congrats with regard to posting this type of advantageous site. Your own internet record isn’t just helpful however it is also truly innovative. Right now click here Cash Advance Many thanks with regard to good function.